This crab creel is suitable for leisure fishing. 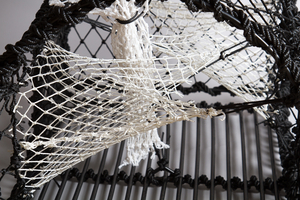 The frame consists of 5,5 mm hot dip galvanized and plastic coated steel wire and the netting is 3,5 mm black braided netting. It has got two wide soft crab eyes which makes it easy for the crab to enter the creel but not to get out. The creel is equiped with a bait bag. 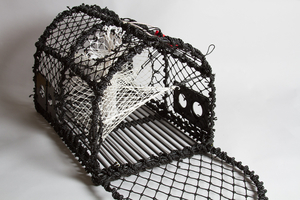 Its got a hatch at one end which makes it easy to collect the catch.